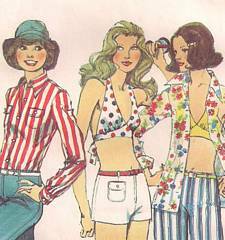 Vintage Simplicity sewing pattern 6348. 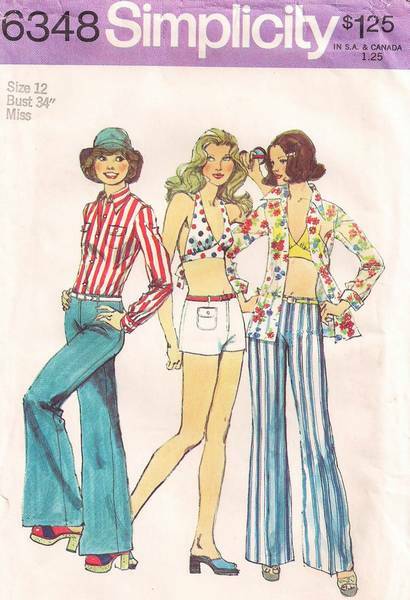 Wide-leg hip-hugger pants or hip-hugger shorts made to be worn 1-1/4" below waist have front zipper, purchased belt slipped thru self fabric carriers and optional patch pocket. Halter type bra top with shaped midriff has V shaped neckline, self fabric tie ends and button at back neck. Shirt has front button closing and long set-in sleeves pleated to buttoned cuffs. Size 12, Bust 34, Waist 26.5, Hip 36.